To monitor the different resources of my local system I use conky. 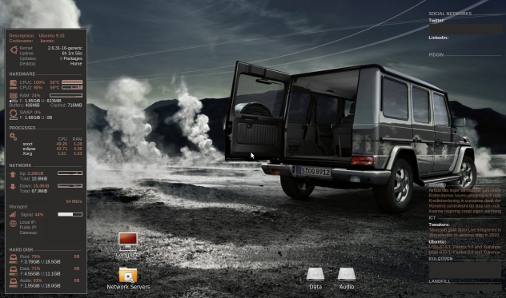 After you installed the conky software you can start with the configuration of it. At the left side there is a pane which only monitors my system resources. The config file for it, conkyrc should be placed in your home directory as a hidden file (naming it .conkyrc). The last pane, on the right top, I configured with for monitoring my social networks and communication. In the conkyrc3 file you need to adopt the twitter and linkedin feed. For the twitter rss feed you need 3 params: username, password, and a token. To find your token, surf to and click on the right bottom to get your rss feed. In your browser url address bar you can find the token at the end of the url XXXXXXXX.rss. For the linkedin rss feed, you need to log in on linkedin.com and search for your own rss feed on the homepage. 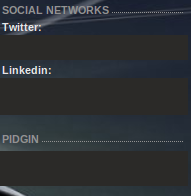 To display pidgin statuses I used the conkyPidgin module.